This morning was cool by July standards, probably in the wake of hurricane Dennis. So I decided to try breeding my tough girls again. I started with a list of about 15 does to breed a week or so ago, and now I’m just down to the obstinate ones. I started with Cupid whose kits are ten weeks old and still with her. Her vent was red enough, so I thought today would be the day. But she just laid there like a lump. I mean a total lump. Nothing Ox or I did made her move a muscle. “Not interested,” she seemed to say. So, I decided to give her Ox’s cage (let her dream about him tonight) and move Ox to my last empty cage. Maybe with no kits to attend to, she’ll be more carefree the next time we try. So I moved on to the virgins. Both had pinkish white vents, so I didn’t even bother. They’ll be on the tough girls list awhile longer. I moved on to Diva. Now Diva is an old broad, probably 5 lbs. She’s definitely past her prime. And she has a thickening on one side of her uterus. 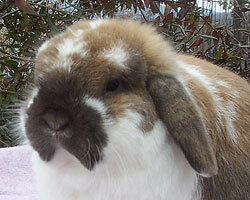 But she produced the #4 Top Lop of last year for her original breeder Jenny Poprawski. And, in her younger days, she must have been a looker because she has ten legs! She’s still got that sassy pose, broad chest, short front legs, and prominent crown. And she’s got a dense ruffle or skirt across her backside. Remember that ruffle. It comes into the story later on. Anyway, her vent was red, so now I’m sure I’ll get a doe bred today. Diva is experienced, if nothing else. So I put her in with Merlin. She is cooperative and then enthusiastic. She breaks away from my grasp and chases my boy around, trying to mount him (that is a hysterical site–a 5 lb. doe and a 3.04 buck). Finally, we get it going the right way and nothing. He tries and tries, but nothing. He’s huffing and puffing, but there’s no satisfying ending for anyone. So I decided to try another buck. Merlin just has bad aim or something, I’m thinking. Luckily, Diva has so many good attributes and meshes with my herd so well, there are plenty of suitable bucks. My next pick is Boris. He’s young and energetic and took to breeding right away. Same story. She is into it. Mounts him. He mounts her. He’s getting plenty of exercise and . . . nothing. Ox. Same story. By this time, I’m getting frustrated. I have said before that if a doe wants to mount a buck, you will get her bred that day. It was looking like I’d have to eat my words. I started getting my elbow scratched from reaching into the cage so often, so I decided to table breed. The lucky candidate this time is LaForge. He has a wonderful body and just needs a wider crown. That Diva has. Good match. On the table, things look like they will go smoothly, but nothing. By this time, I’ve check to see that she will rise on cue and she does. Now I’ve decided to comb out the hair around her vent. There are some sticky, pointy hairs. I’m thinking that the bucks are getting poked and are avoiding the area in question. Now I’m optimistic. I’ve removed the obstacle. I’m going to get one of these tough girls bred. But it’s so fluffy and soft now! What’s the problem? So I flip her on the back and look around, hoping for inspiration. She’s ready. He’s ready. She’s into it. He’s into it. Then I noticed she was damp about 1 1/2 inches behind her vent. The aim is off. Remember that ruffle? Being older and overweight? She’s saggy, too. Everything’s in the way and with all that strechy skin, the vent has slipped further away from the tail. So I’m desperate now. I grab the fur at the end of the tail. Put her into position and put the tail up towards her head, repositioning the vent about 1 1/2 inches back. I put LaForge into motion. And, Wham Bam Thank You Mam, she is bred in under 10 seconds flat! I repeated the procedure about five minutes later and she was bred within 15 seconds. Things didn’t fall into place; I had to stretch them into place! Finally, I can cross one of the tough girls off my list.